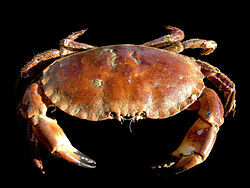 A partan or cruban is a teep o crab (Cancer pagurus) that for ordinar bides in the sea. Some fowk eats them in partan bree. Its tangs is cried partan's taes. Wikimedia Commons haes media relatit tae Cancer pagurus. This page wis last eeditit on 9 October 2017, at 20:29.